This engaging, self-paced instructional video course demonstrates various aspects of configuring Windows 10 devices. You learn methods and technologies that help you develop device management policies, mitigate data loss, manage applications, and improve security of Windows 10 and integrated Azure features. 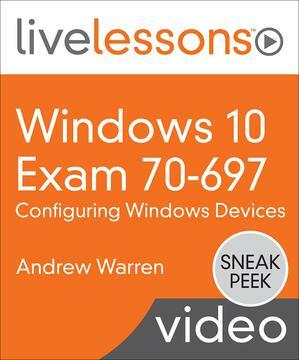 If you're planning to take Exam 70-698: Installing and Configuring Windows 10, this video course covers the exam objective domains published by Microsoft in a logical way for learning the technology and preparing for the exam. Throughout each lesson, IT trainer and technical author Andrew Warren describes key concepts and puts them into action with demonstrations and real-world scenarios. You can follow along by building a test lab using virtual machines.